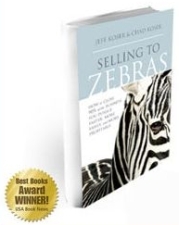 Selling to Zebras: How to Close 90% of the Business You Pursue Faster, More Easily, and More Profitably, by Jeff and Chad Koser (Greenleaf Book Group Press, 2009), came highly recommended, and I was sent a review copy by the authors’ Vice President of Marketing, Christine Ullman. The book arrived in a box wrapped in funky zebra wrapping paper, with a personal note from Chris. As someone who does P.R. for a living, and who has reviewed many books, this really stood out. Give this woman a bonus! 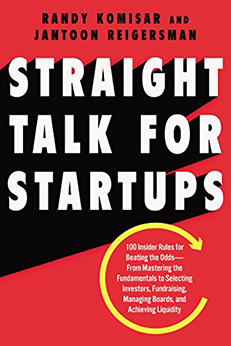 Anyway, I eagerly started reading this book, and found some terrific nuggets. Then I started reading more and thought it was really targeted at larger companies than mine, so I put it aside. 2) There’s some really good stuff in this book that I can use right now to help me with my challenge. On to my business challenge and how I solved it. . .
First, you’ll need to understand what a Zebra is, in the context of this book. A Zebra, according to the authors, is the prospect that is perfect for your company – and not just from a product or solution perspective. It is a prospect that you know you can win based on identifiable, objective characteristics – and Zebras are the only prospects a salesperson should pursue. Why did the authors choose a Zebra to symbolize the perfect prospect? The authors say it’s because a Zebra’s stripes tell you exactly what kind of animal you’re looking at – you can’t mistake a Zebra for any other animal, so you know for sure when you have one. In the book the idea of a company’s Zebra is explained in story form. The head of a sales team is in danger of losing his job (and possibly the jobs of his salespeople) due to dismal sales. By learning about the Zebra process, he is able to turn things around. One of the most compelling aspects of the book is the creation of the Push-Button Zebra, a spreadsheet you can use to identify the worthiness of your prospects. 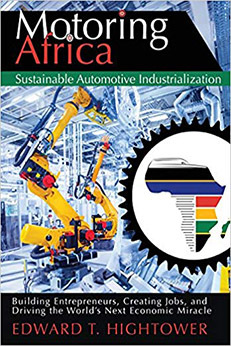 The book gives examples of the different attributes that can be considered for your own Push-Button Zebra spreadsheet. In the book you are also given access to a free template to create your own Push-Button Zebra. Now I can explain my business challenge. I was recently contacted by a prospect to do P.R. He had a great product that I was interested in representing, but he was getting proposals from several P.R. companies, and I had an uneasy feeling about this. I needed to make a decision about whether or not I was going to do a proposal for this company. Then I remembered a similar situation in the book, where the head of sales was given a “prospect” by his boss, and based on the Push-Button Zebra, the head of sales realized this was not a good prospect, and didn’t want to waste anyone’s time putting a proposal together. Since I hate doing proposals, I didn’t want to do one unless I absolutely had to. So instead I decided to use the more objective Push-Button Zebra process to aid in this decision. There are seven attributes with a maximum score of four, so the highest score that can be achieved is a 28. Zebras are in the 20-28 range. My prospect scored a 12, which was close to a high risk prospect. Based on this decision, and my gut, I decided not to pursue the prospect. I’ll be using this spreadsheet to determine whether or not to move forward with other prospects, and I urge any of you who are responsible for sales, to do the same. Margie Zable Fisher is the President of Zable Fisher Public Relations, helping small businesses connect with clients and potential clients online and offline through Public Relations, Social Media and Marketing. She offers free, award-winning tips at Zable Fisher Public Relations. Nice review, Margie, and really awesome that you took the Push Button Zebra attribute test! I like how the Zebra image is used, because it helps to visualize the importance of what prospects should be pursued and avoided. In this day and age, systems on how to best organize your leads are truly the ace in the sleeve, and this sounds like a great ace. Thank you for this review and your assessment of Push-Button Zebra! Thanks, Pierre, and thanks everyone for your comments! Nice review, Marge. Good advice. Thanks for posting it. Thanks, Tom. I keep using it to decide if a prospect is a good fit, and it’s working well!